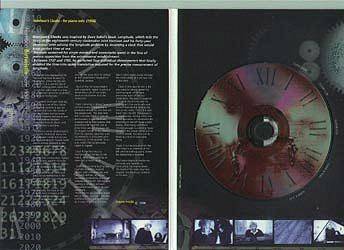 Harrison BIRTWISTLE Harrison's Clocks Joanna MacGregor, piano. 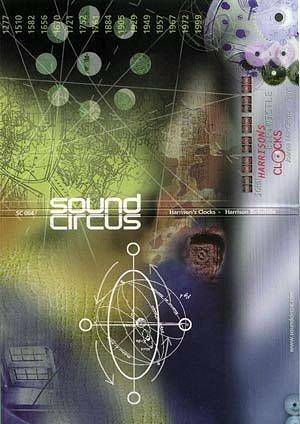 Sound Circus SC004. 26'18"
This is one of the most important piano works to have appeared towards the end of the 20th century. After Joanna MacGregor's exclusive rights expire, every aspiring new music pianist will tackle these five pieces, and they will take their place in the 2000 piano repertoire alongside the Ligeti studies, which seemed so impossible at first and are now standard repertoire. There will be other recordings of Harrison's Clocks, but this is a worthy first. They were inspired by the Sobel book Longitude, about the painfully prolonged gestation of John Harrison's sea clocks, now preserved at Greenwich; and the link with Harrison Birtwistle's shared name. There are five substantial pieces, each starting with a rush of notes down to the bottom of the keyboard. In Clock I irregular contrary motion and staccato figures are deliberately out of phase. Next a mechanical fantasy with an alarm bell. Clock III variously combines six figures in pairs. Clock IV introduces each of its four sections by repeating the opening signal of the whole work. The last is a toccata with reversed delays between the hands, ending, as each piece does, 'because the clock-spring has broken down', as explained in Stephen Pruslin's helpful notes. Jewel cases seem to be on the way out? In a slimline cardboard case, slender for storage in bulging collections, the presentation and artwork are delightful, save only for not resisting the temptation to compromise legibility by fashionable over-printing; no matter, reading all the information is worth the effort! Naughty (and unnecessary) to suppress the total duration, revealed on my CD player - only afterwards did I spot that the individual timings are given, in tiny print, to be found around the CD when it is replaced in the case! Sound Circus CDs are mid-price, and this is one to play over and over again, so complex and swift is the musical thought. If this latest release on Joanna MacGregor's own label enjoys the success it deserves, perhaps a recording of Birtwistle's piano concerto, which Joanna MacGregor premiered, may follow? Enjoyment is enhanced immeasurably by listening with the inexpensive score (Boosey&Hawkes). Although it requires a consummate pianist and musical mathematician to get round these fiendishly complex constructions at the keyboard, exploring some of the patterns with the score (if only at quarter speed and one hand at a time) offers a window into creativity!